How do we understand human-computer interaction (HCI) in an age of ubiquitous computing? As the build environment is increasingly embedded with computational affordances, the ability to identify civic subjects—their location, preferences, secrets—has become trivial in a society characterized by the generation of massive data points: the metatags, the website cookies, the digital transactions, the GPS wayfinding, and so on. The IT industry orientation toward data-driven and smart technology design illuminates a sociotechnical landscape characterized by increased automation and growing ubiquity of human-to-machine as well as machine-to-machine (M2M) processes. This paper looks at the shifting models of HCI practices—specifically data-driven design in the built environment and its civic implications—to explore emergent ontologies that include conditions of privacy, access, and equity in user interface (UI) and user experience (UX). The paper focuses on HCI examples across platforms such as internet of things (IoT) systems, augmented reality (AR) interface, and locative UX design. 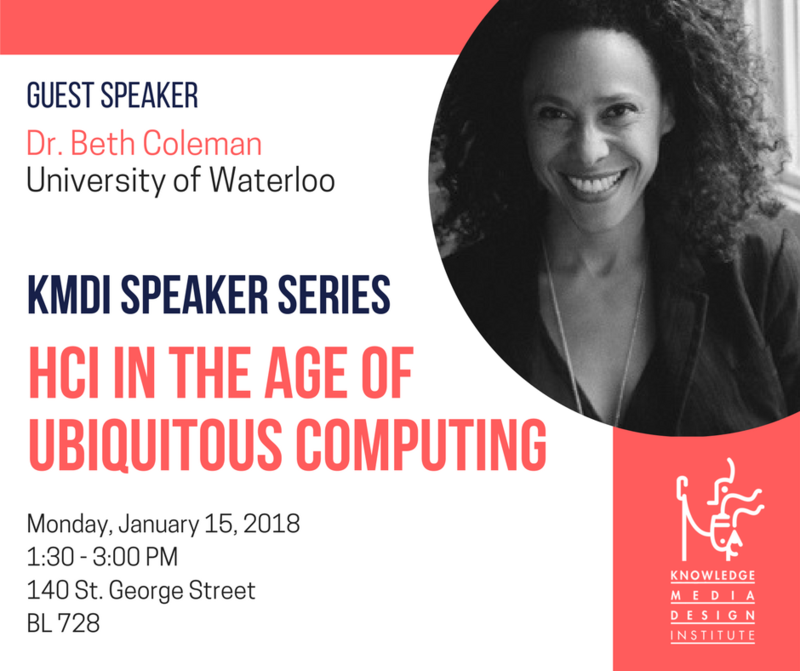 Dr. Beth Coleman is Associate Professor of Experimental Digital Media at the University of Waterloo where she directs the City as Platform Lab. Her work focuses on smart technology, big data, and civic engagement. Her practice engages research methods and artistic inquiry towards the creation of public, civic, and poetic works. She is the co-founder of SoundLab Cultural Alchemy, an internationally acclaimed multimedia art and sound platform. She had published the monograph Hello Avatar (MIT Press) along with numerous research articles. Her research affiliations include executive committee member of the UWaterloo Games Institute, Berkman Klein Center for Internet & Society, Harvard University, and expert consultant for the European Commission Digital Futures. She is a founding member of the Microsoft Research Fellow Social Media Collective and currently a visiting professor at Data & Society Research Institute, New York.